In this day and age of online reviewers, everyone believes they are an expert. Untappd beer reviewers are notorious for being biased towards rare beers, sour beers, high ABV styles, hoppy styles, and overly sweet styles with lots of fruit and spices added while having little knowledge of traditional styles or styles that don't fall into the above listed categories. In the Untappd world, an exceptional beer is one that is given a score of 4.5 or above, a really good beer is given a score of 4.0 or above and an average beer would receive a score of 3.5. The Great American Beer Festival is the largest beer competition in the world. 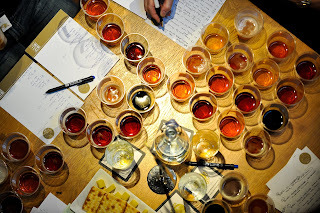 Thousands of beer entries are judged blind by BJCP certified beer judges with years of beer judging experience, knowledge and training that compete for gold, silver, and bronze medals in various style categories. Below I have compiled Untappd ratings for all GABF medal winner beers in each individual style category. With a few exceptions, the stereo-type that Untappd tasters rate rare, sour, high ABV, hoppy, or fruited and spiced beer styles much higher than other styles holds true. Also that there is a lack of understanding and appreciation of traditional styles by Untappd tasters. The average Untappd score for all 275 GABF medal winner beers is 3.7. These medal winning beers are the best of the best in the world, so an Untappd score of 3.7 would be considered very low. Of all the GABF medal winner beers, 12.4% received an Untappd score of less than 3.5! While only 2.9% received an Untappd score higher than 4.25. Interesting data set for sure. Everyone's palate is different that's the great part about craft beer tasting, but just because a beer is a "white whale" doesn't make it the only great beer around. I'm sorry but this is pointless. A BJCP judge is NOT rating how much they like a beer. So this is comparing apples and oranges.